Ameri-Brand Semi-Custom Boat Covers are an excellent, cost effective solution for covering older boats or models where custom-fit covers are unavailable. Just because a cover isn't "custom-fit" doesn't mean you can't get a good fit. Semi-custom boat covers are still manufactured to fit the style, shape and size of your boat. Here is an explanation of the differences between a Custom Fit Boat Cover and a Semi-Custom Fit Boat Cover. Our cotton covers are not trailerable (pulling the boat with this cover is not recommended) and should only be used for storage and mooring. However, our other two Semi-Custom fabrics, 100% Solution Dyed Marine Polyester and the 50/50 Poly-Cotton Blend, both perform well during towing. If you plan on using your cover for trailering purposes, it is critical to properly secure the cover to the trailer in key areas. We are currently offering a FREE 12 Strap Tie-Down Kit & Storage Bag, which you can see on our Boat Cover Accessory Page, with the purchase of every new boat cover. Additional product specifications on our Semi-Custom Boat Covers are listed below. FREE tie-down kit contains a quantity of 12, one-inch wide, black polypropylene straps with quick release buckles. It's the best way to tie down your cover to the trailer. Much better than "bungees". 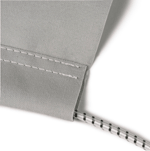 All of our covers come with double reinforced tie-down loops spaced about every 3 feet around the perimeter. 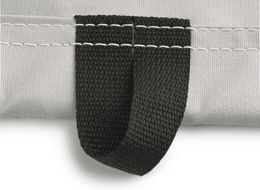 These tie-down loops along with the tie-down kit straps secure the cover to the boat trailer. Covers for outboard models come with the Outboard Motor Hood attached to the cover with the exception of pontoon boats which have a separate cover provided. Weather resistant anti-wick thread used throughout in construction. Each Boat Cover includes a braided tie-down rope and warranty.